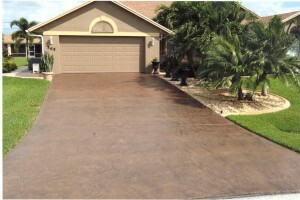 The options are endless when it comes to choosing a style for your new concrete driveway. Probably one of the most popular choices for a new concrete driveway overlay is the Classic Texture. Classic texture is a robust, modern and clean looking surface finish that provides slip resistance, a range of color choices, ease of maintenance and looks fabulous when done. It will hide surface imperfections and last for years with minimal maintenance. For those who currently have an old pitted, chipped or cracked driveway, a resurfacing system can give them many different design choices and looks. Concrete resurfacing options will cover up old damaged concrete and provide a fresh new look that may include, Stamped concrete, Tuscan Overlay, Sunstone and many more finish choices. You will also find that using driveway refinishing is one of the greenest options in Nashville and all its surrounding areas. Since driveway coatings do not require the removal of the old concrete, there is very little waste and the concrete overlays are designed to outlast many other driveway surfaces, and when installed correctly have very little impact on the surrounding areas and nature.